The Port of Esbjerg is the leading port in Europe in terms of handling and shipping out wind power. The port played a key role in the rise of Denmark’s offshore wind industry, which took off over a decade ago with the installation of the world’s first large-scale offshore wind farm, Horns Rev I. Today, the Port of Esbjerg has specialised facilities and flexible areas for transporting, pre-assembling, shipping out and servicing offshore wind turbines. The companies at the Port of Esbjerg represent the entire supply chain for the wind industry, including several of the world's leading companies specialised in handling and servicing wind installations. 4/5 of the offshore wind capacity installed in Europe was shipped out from the Port of Esbjerg. Apart from Horns Rev I and Horns Rev II, the Port of Esbjerg has been the primary base for a number of foreign wind farms. These include Butendiek, Northwind, Sandbank, Dantysk, Humber Gateway and Westermost Rough. In 2017 alone, 1,300 MW of offshore wind capacity was shipped out from the port. 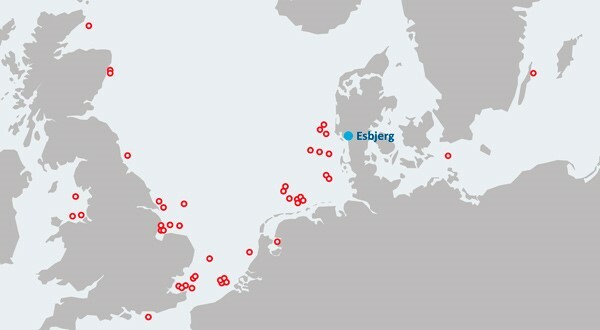 The map below shows the offshore wind farms, which the Port of Esbjerg has been involved in.